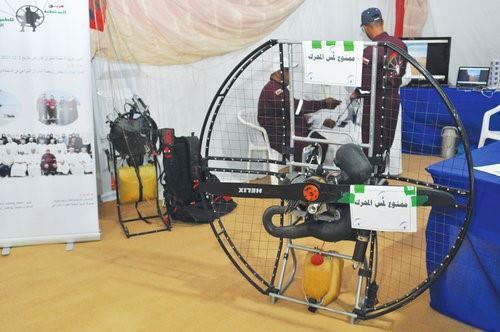 (MENAFN - Muscat Daily) Muscat- Oman Gliding Team is promoting the sport of paramotoring in the Naseem Gardens venue of Muscat Festival. Speaking to Muscat Daily, Abdul Samad bin Habib al Saadi, head of the team, said, 'The sultanate's gliding team, formed in 2017, comprises 15 members. The team is participating in Muscat Festival for the second time, attracting curious youngsters in large numbers to their stall. Describing the sport, Saadi said there are two types of paramotors - foot launch and wheel launch. The foot-launch models consist of a harness attached to a frame, which has an engine and a propeller. The frame also includes a hoop and protective netting to separate the glider from the propeller and the engine. The glider wears the paramotor like a large backpack which is attached to paragliding wings. The wheel launch models include a cart, usually having three or four wheels with seats for one or two occupants, besides the components of the foot-launch type. The glider controls thrust via a hand-held throttle and steers using wings brake toggles, stabilo steering or weight shifting, or a combination of all three. It is identical to paragliding except for the fact that it is powered so the use of an elevation or thermals - where air rises due to heat - to ascend are not required. He informed that those who take up the sport must undergo a medical examination and run regularly. The team performs several shows throughout the year and undertakes courses in first aid and cardiopulmonary resuscitation. 'I urge youngsters to take up this sport because it'll help them gain strength, courage, endurance and patience,' Saadi said. Oman Gliding Team can be contacted on 99248989 and 92911821 (WhatsApp).